This incredible London-based 7-piece is led by Austrian bassist Stefan Redtenbacher who draws his inspiration from jazz, funk and soul. Stefan has established himself as the UK’s groove bass player of choice for many artists, with a list of musicians with whom he has worked including Steve Winwood, Sam Brown, Herb Alpert and Danny Gottlieb, while his own recordings feature “jazz/funk” legends Fred Wesley (Parliament, James Brown) and Elliot Randall (Steely Dan). The Funkestra’s name pretty accurately describes the high-energy feel of the music as this band, with its fiery two-horn frontline and slinky guitar, perform original funky grooves with an authority and style that is hard to beat. Tonight the band will be playing music from their latest recording, “Part of Me” (released at the Club with considerable fanfare last June), featuring their wonderful singer Helena May in what expat Austrian bass player Stefan playfully refers to as "Strudel Funkateers meet bushy-tailed soulstress"! 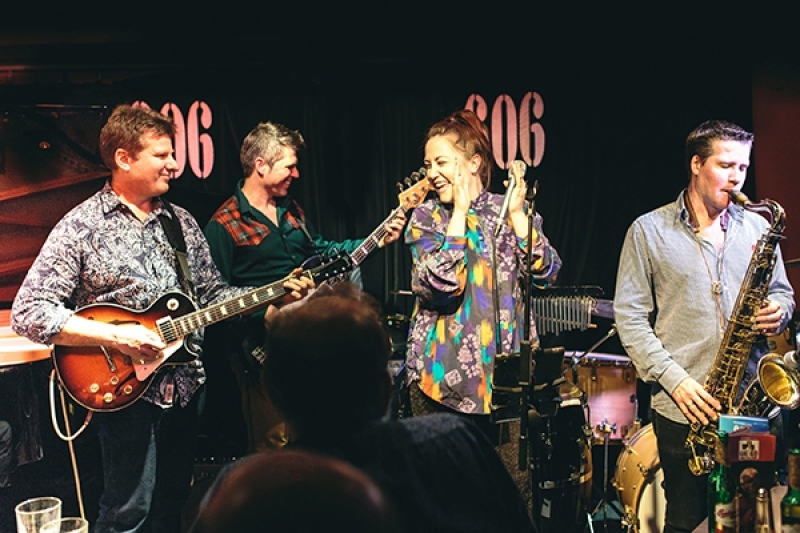 Over to Stefan for a description: "In 2017 Jazz Funk band the Redtenbacher's Funkestra teamed up with newly in-town, high energy vocalist Helena May for their regular live shows at the 606 Club. This was so well received that the next logical step was to record together. The album ‘Part of Me’ - the Funkestra’s 12th release - features a collection of funkified, 'out-of-the-box’ re-imaginations of classic pop songs. The combination of Helena's vocal style and the wall-to-wall Funk of the Funkestra has resulted into a creative ‘pop/funk mash-up’ full of fun and energy". Couldn't have put it better myself! The band, as you may have gathered by now, is highly entertaining with tremendous musicianship applied to some amazing music. A guaranteed great night out!